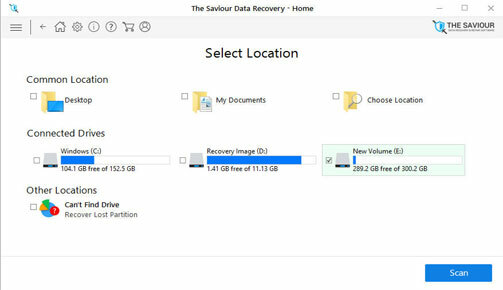 The Saviour Data Recovery Software recovers all lost or deleted data from your Windows hard drive and the attached removable devices. It can also retrieve the lost, formatted, or deleted partitions of the hard drive. This tool provides 'Select What To Recover' and 'Select Location' feature for users to choose the type of files they wish to recover and the location of those files. Its easy-to-use Graphical User Interface permits users to select the required files and drives to be scanned to recover the lost data or partitions. 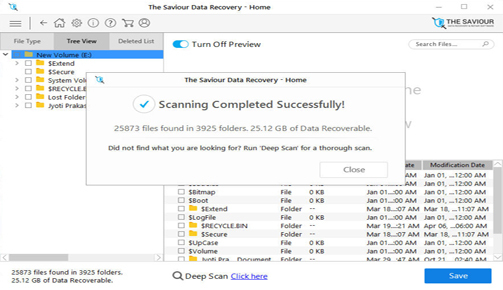 The Saviour Data Recovery software provides scan feature for a thorough scan of the selected files saved to the selected media device. Further, it provides a preview of the scanned files and folders on the hard drive or the removable devices that are attached. 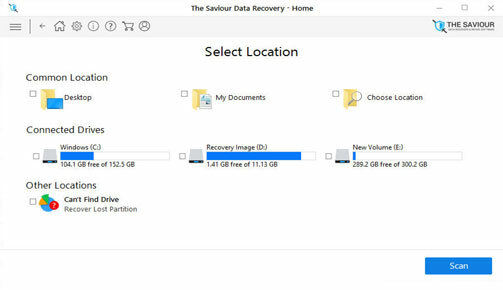 The Saviour Data Recovery tool impeccably recovers all lost or deleted data and then gives users the option to save the recovered data at the location of choice. It can recover all multimedia data such as text, photos, audios, and videos including Outlook emails and other data. The Saviour Data Recovery Software is a comprehensive and user-friendly tool to recover all your lost or deleted data that can be anything from text, photo, audio, or video files of more than 300 file types to Outlook emails. This Windows based tool can recover all these data from the hard drive and the connected removable devices. Its advanced preview feature that can be turned ON/OFF enables you to have a glance of the recoverable data before saving the recovered data. 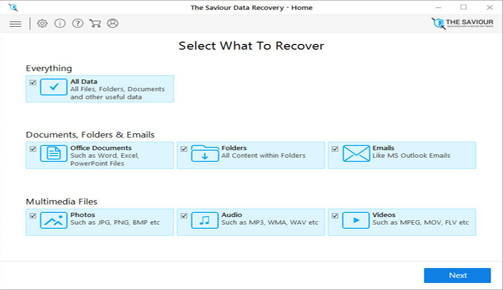 The Saviour Data Recovery Software supports Hard Drives and other Removable Data Storage Devices except for CDs and DVDs. It also supports logically damaged or corrupt hard drives. The software recovers all your lost or deleted data, be it text, image, audio, or video files from the hard drive running Windows operating system or the connected removable media devices. It can recover data saved in 300 file types in total. The tool possesses the ability to recover all partitions lost, deleted, formatted from of your hard drive. For this, the software provides 'Can't Find Drive' option in the'Other Locations' interface of the Windows recovery software. 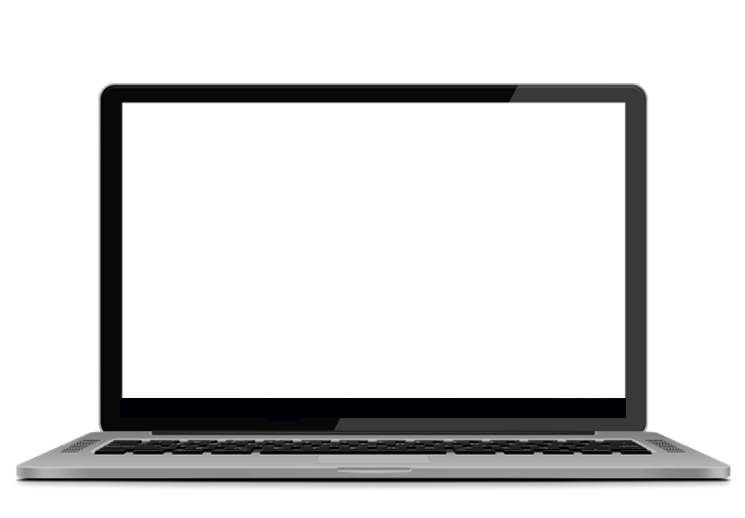 The utility can recover all lost or deleted mobile phone, camera, or SD card data as long as the device is attached to your Windows system. Thus, if you have lost or accidentally deleted data and wish to recover them, you should connect the SD card or the respective devices to the system and run the utility. The software is designed to recover lost or deleted data from healthy hard drives as well as from hard drives that have been logically affected. The reason being, the software can detect logically damaged hard drives. Embedded with an advanced scan feature, the tool scans the selected file types located on the drives of the Windows systems and gives scan results. The scan result contains only those files that can get recovered. The utility supports the raw recovery of the hard drive volumes to search data files based on file signatures. It also supports the raw recovery of HD-MOV file format, the Canon camera model. The tool supports hard drive volumes of various file systems such as FAT, FAT 16, FAT 32, NTFS, and exFAT all of which can get scanned simultaneously. Thus, you can use data storage devices of any of these file systems. 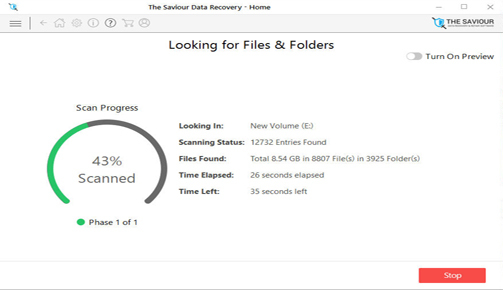 The Saviour Data Recovery software recovers more than 300 file types that include text, photo, audio, and video data, from systems running Windows 10, 8, 8.1, 7, XP, and Vista. My biggest win after using this software is that I had recovered all my lost data from my old hard drive. My hard disk was almost dead, and I had to recover all my stuff from it. So I planned for using this software. I am glad to have this software in my life. It's really really worked for me. I would like to say that your Windows data recovery software is absolutely fabulous. I have purchased it yesterday and recovered up-to 96% of my data. Software took around 1.5 hours to scan my hard drive and transfer to recovered data on external drive. The best part is I have got all the files with their original file names.